I get asked how to lightly felt wool a lot. At the end of the article I’ll show you the easiest (but not the quickest) way to lightly felt your wool roving in preparation to knit it up into a gorgeous project. 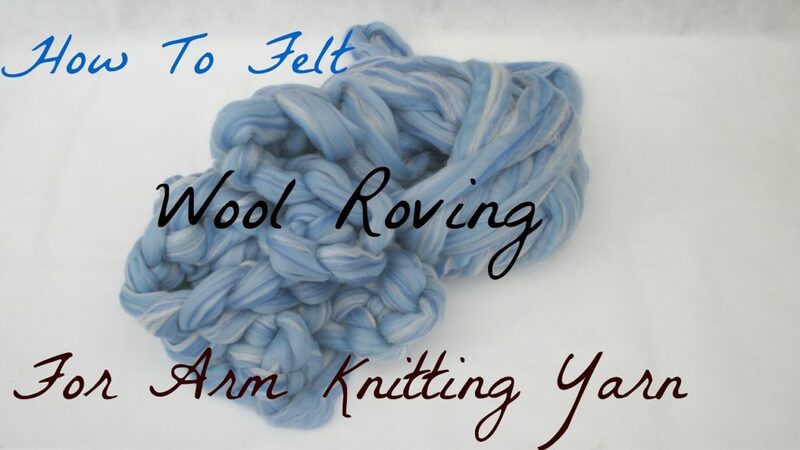 There are many ways to lightly felt roving. I’ll tell you my favorite way. It is the most time consuming, but is VERY easy and takes about 20 or 30 minutes per kg (2.2 lbs). Wool felts by friction and the friction of running it gently through your hand and it rubbing against itself as it’s pulled out of the centre pull ball, knitting, and unraveling it all contribute to a light felting. When it’s ready it should be bouncy and hold together without a hint of stretching out to a tear when tugged on firmly. What it was originally used for: There are a few things that are VERY important to know before you start knitting up wool roving. First of all it was never made for knitting to begin with. Most people needle felt it or wet felt it into scarves, clothing, hats, home decor and toys. Is perfect for arm knitting it doesn’t pull apart, you can hand wash the knits with ease and even spin them out in the washing machine without them felting together. If you just knit up the roving as it is it will shed EVERYWHERE! The bad news does not stop there, it also falls apart fairly easily. If you tug on your blanket to hard you may notice some of the roving actually pulling apart and your knit slowing being destroyed. Even if you very carfully hand wash it the chances are you’ll have wool coming off in the bath or in the drying process. It’s for these reasons I NEVER arm knit with wool roving without first lightly felting it. Once your wool is lightly felted it can be knitted up, used hand washed, fluffed and dryed. I’ve put a picture of my scarf in the picture above to show you just how it looks after it’s gotten a significant amount of use and been washed 3 separate times. Blankets have the same results. Some people prefer their blankets to be knitted without fluffed which results in a very tight yarn shown in the cable blanket picture to the left, while others like the fluffed look shown in the seed stitch blanket picture to the right. The felted wool is flatter and more dense, it’s stitches are not as fluffy. It’s gone through the felting process described below probably around 10 times and is VERY felted. However the felted and fluffed roving has actually gone through the same process but only about 3 times which makes it lightly felted. After a knit is washed it felts more and can be fluffed by pulling the felt gently apart with your fingers. You can see the washing and fluffing process here. Be sure to share this info with your friends. There are unfortuantely loads of arm knitters knitting up wool roving without knowing it needs to be lightly felted first. The result…. disasterous. Blankets pilling, fuzzing and shedding everywhere and I’ve even heard horror stories of parts of blankets tearing apart! Help spread the word by sharing your knowledge. 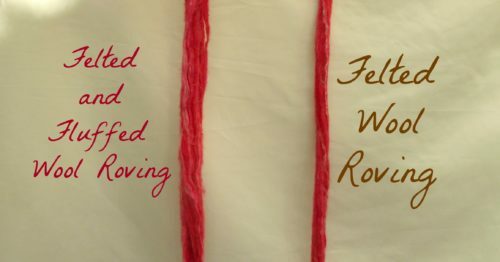 How do you “fluff” the felted roving? After it’s been felted quite well it can be fluffed by gently pulling the fibres apart, just until it returns to it’s original puffiness. Unfortunately I don’t have a video on this yet, however I am doing a LIVE arm knitting webinar next Wednesday where I’ll be demonstrating how to fluff felted wool roving yarn. You’re welcome to register her if you want to join http://trulymajestic.com/2404-2/ I hope that helps! Hi Stacy, can I do the same treatment for microfiber roving yarn? Hi Sheeny, I’ve never tried it on that. However in my own experience with microfiber fabric it tends to get very rough with use. I would strongly suggest you try it out on only 1 meter first. Id really like to know how it turns out if you are going to go ahead and felt it. This is new territory your on! Sorry I couldn’t be of more help.